Oral-B has a connected toothbrush. You don’t need it. Oral-B, the ubiquitous name in dental care, is launching what it calls the first connected toothbrush. While Oral-B is bringing some added functionality to the table, I actually tried a connected toothbrush about a year ago from a startup called Beam Technologies and at CES a French firm called Kolibree showed off its own connected toothbrush. So it’s far from the first. Oral-B says that the brush has a Bluetooth radio and will send your brushing data to you via an iOS (s AAPL) or Android (s GOOG) app, but it will also accept programming so you (or your dentist) can tell the brush where you want to spend the most time. The app also will show you news and weather or whatever while you are brushing, making those two minutes fly by. This would be so much cooler if the brush played the information while you brushed — the way my daughter’s musical toothbrushes play Selena Gomez songs. The Oral-B interactive toothbrush will be available in limited quantities in Germany this spring, with global rollouts in June 2014. The Oral-B app will be available for iOS in May, and in Android in August. The Oral-B smart brush will cost up to $219 for the highest-end smart brush. 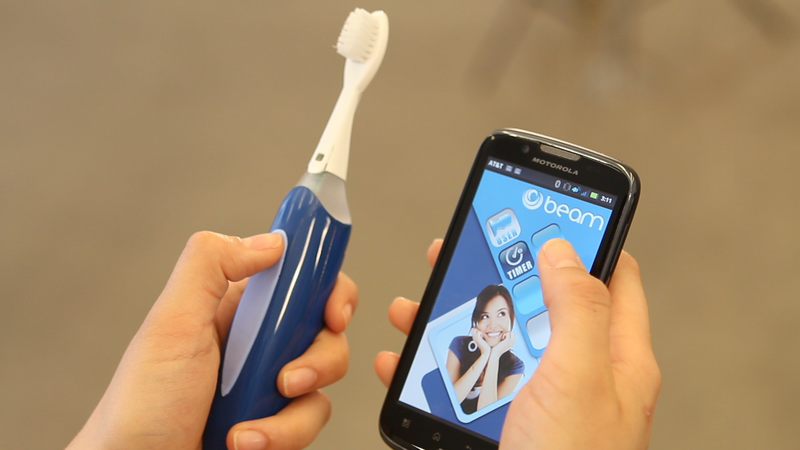 The Beam toothbrush that launched in 2013. I’ve tested connected toothbrushes in the past, but my Philips Sonicare is the highest-tech toothbrush I currently need. When I used the $50 Beam brush, I had data streaming to my phone, but absent a pressure sensor (which the Oral-B has) I didn’t get much out of the experience. I thought it might be useful for tracking my daughter’s toothbrushing, but that wasn’t worth the premium. And while the CEO of Beam and I discussed getting data to dentists, my own dentist was skeptical of the technology when I asked him. He said that he’d rather someone brush their mouth well in all four quadrants than focus on any one area. Anything that helps people brush longer was great for him, but he didn’t think that there was value in the data. Insurance firms might beg to differ: Knowing when policyholders brush would be super-valuable information — though people who are a bit more casual about their dental care might not want to share their brushing habits. In short, a connected toothbrush, even a fancier one with a few more sensors, isn’t the item I’d want to spend my connected home budget on. Using a brush with a revolving brush head and making sure you brush for two minutes all over your mouth may be boring, but it’s the most effective clean. Eventually this sort of functionality will be built into the cost of a toothbrush, but until that time, I can’t see a clear health or convenience reason for splurging on such a product. Simply adding connectivity and data tracking capability to a product isn’t a viable strategy for building a truly beneficial consumer experience. Although I expect a lot of brands to launch silly goods like this to ride the Internet of Things bandwagon, I can’t wait until we’re out of the add-connectivity-for-connectivity’s-sake stage of this evolution. My hunch is we’ll look back at these brushes and realize they were the Pets.com of the internet of things. Oral B’s battery life has gone to hell. I am not buying another toothbrush with a non-replaceable battery. For adults, it’s probably not the most interesting piece of technology, but for my 12 year-old, who’s not as disciplined about his oral hygiene as he should be, this is could be a way to make the brushing process trackable and more interesting. That’s what I was keen on Beam for, but I found I was still nagging my child to brush. The only difference is I would check and app and then have to stand by and make sure she did it, instead of just standing there the first time around. Although she is 7, not 12. I think beam have a problem with their rewards program.you gather points towards a long term reward instead of having immediate and addictive rewards of some sort, maybe like having an access to a new levels to candy crash after brushing. This looks like one of those classic, Dilbert-esque examples of a relatively high-up manager opening the newspaper and asking “Everyone is doing ‘Internet-of-Things’. Why aren’t we doing ‘Internet-of-Things’ here?” And nobody who hears him is brave enough to say no, so it trickles down to a team of engineers who sigh and throw this needless device together just to answer that needless question. Isn’t the only real value in something like this is that it keeps tabs on how often and how long your brush, so it keeps you from skipping a before bed brushing? No way, absolutely no need of it. Wonder where technology is heading towards.